EP released on April 2013. Documentary. Titsanus is a musician and performer living in Brussels who hijacks, transforms and modifies objects and sounds. His filmed diary is a blend of notes, events and experiences. He's also talking about his life or at least the life that must have any pop star. « I have some feedback in my head, my sound is like sentences which would have made a trip around the world through network data Internet. 1_ choose an empty room. 2_ gather all the devices you can find that produce sound and image. 3_ connect all the guitar amp, bass, speakers. 4_ connect all cameras, video monitors, automatic switch. 5_ put a blue video zentai. 7_ set at maximum level. 8_ put you in the center. Take the cameras in your hands. 9_ move and make music with the microphones of cameras. 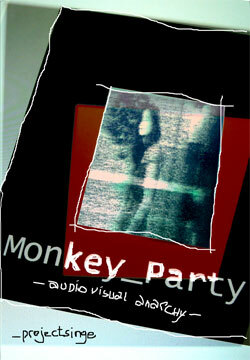 Monkey_Party approaches DVD-video support not like a simple storage but like a creative technology. This interactive and random generating video DVD is proposed by the projectsinge group. Monkey_Party It’s an alternative audiovisual encounter between performances, video, experimental cinema and digital art.